Want to learn about car caricature art? In this series, leading digital artist, April Eriksson, takes you through how to create a fully-rendered painting of a 1967 Mustang. So, if you’ve ever seen Pixar’s hugely popular Cars movies or wondered how to create vehicles for computer games and animations, you’ve come to the right place! During this series, you’ll learn a range of professional Photoshop techniques which you’ll be able to apply to other areas of your artistic career. April Eriksson has produced work for a huge range of projects, including Transformers and GI Joe: Renegades, and is regarded as one of the best in the industry. Now, she’ll be sharing the tricks of the trade with you and giving you an insight into how she creates her awesome illustrations. So, hop into the driver’s seat, put the keys in the ignition and let’s get going! In this series, you’ll be using a variety of sources to create a fully-rendered digital painting of a 1967 Mustang, including photos of real cars and more stylized, cartoon-like images. To start with, search for images of a Mustang online and pick the ones you like best. 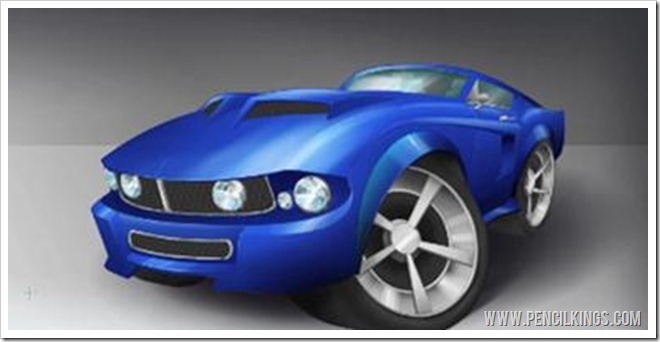 Then, search under cartoon cars for some suitable stylized images. In this series, you’ll see how April begins with a thumbnail sketch of the side view before developing this into 3D lineart ready for rendering. Before you start drawing, it’s worth going over some design principles about shapes and how they work. This is what your object looks like in 2D and this is what you’ll be using to create your initial thumbnail sketch. You’ll be using a variety of organic, curved lines with harder, angular lines and using the basic shapes of a square, triangle and circle to create your drawing. 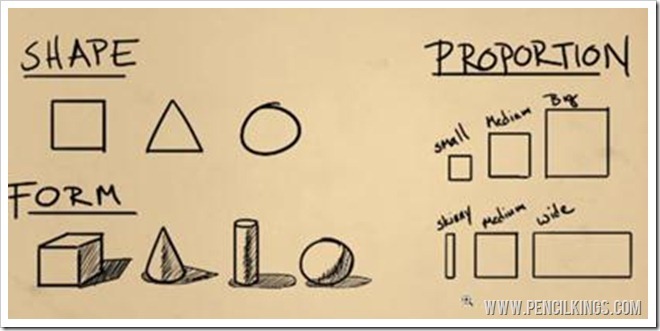 When you turn your 2D shapes into 3D, they become forms rather than flat objects. This means that a square will become a 3D box or a rectangle, your triangle will become a cone and your circle will be transformed into either a cylinder or sphere. If you look at the reference photos of real cars in this video, you’ll notice that the shape of the car starts off with a long hood before getting shorter as you reach the trunk. This is because the proportions of the car are altered by perspective. However, in the stylized car illustrations, you can see that everything has been squished to create a fun, cartoon-like effect. This technique is often used in car caricature art and employing a combination of wider, smaller, skinnier or larger shapes is a good way to create an eye-catching design. 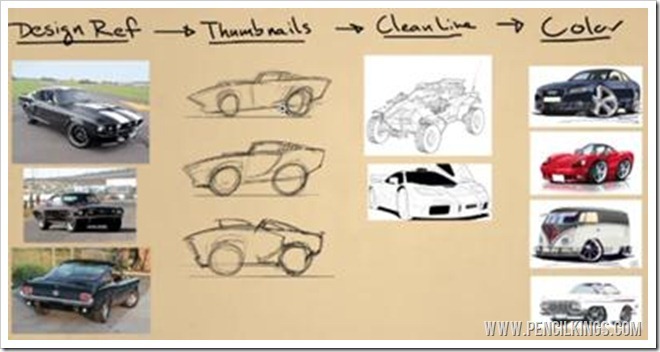 To create your series of thumbnail sketches, try and combine elements of the real car with the cartoon one and think about how you can incorporate all the various shapes into your drawing. So, to get started on your thumbnail sketch, select a small brush and hold down Shift to draw a straight line for the ground. 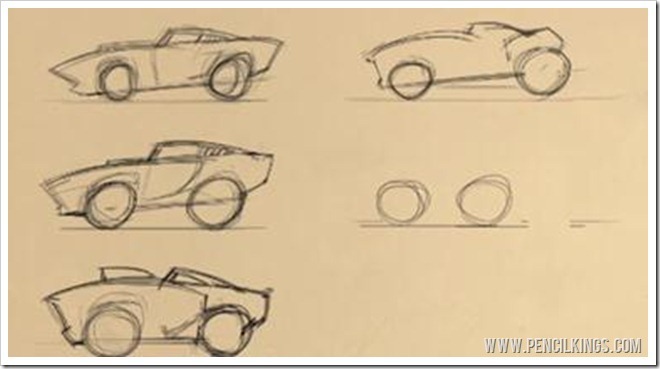 Then, sketch out some wheels and have fun experimenting with different shapes for your car. You can try as many different combinations as you like – for example, moving the wheels closer together will give you a fun, cute feel as seen in your stylized reference illustrations. In the next lesson, you’ll see how you can refine these initial thumbnail sketches before choosing a final design to develop into a fully-rendered digital painting of a 1967 Mustang.